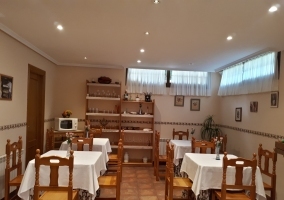 This spectacular inn located in the town of Argoños, a beautiful rural area belonging to Cantabria , has a wonderful and large garden that surrounds a building 2 floors built on a field dedicated to the cultivation of vegetables and opened 15 years ago . 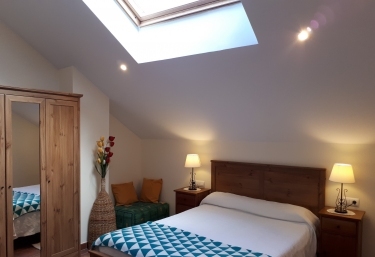 The accommodation has a total of 9 double rooms , some with double beds and others with double single bed, which can be converted into triples thanks to the extra beds that makes the establishment available to the guests. 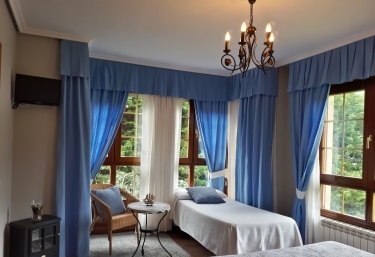 All rooms have traditional wooden furniture but, at the same time, exquisite and careful. In addition, each room has windows and private terraces, with its corresponding set of outdoor table and chairs, from which contemplate the impressive gardens of the complex and the field of mountain systems that surround the place. Each bedroom has a full private bathroom for the comfort of all tenants. In fact, some of them offer a whirlpool bath to further relax the clients. The accommodation mixes the tranquility and comfort of a rural complex, with all the advantages and amenities that a hotel can offer the user. That is, it is an ideal option for those who seek to disconnect from the routine but, at the same time, enjoy a comfortable getaway with all services. In fact, in our accommodation it is possible to enjoy a complete breakfast that is offered in a spacious dining room that, together with a living room con several sofas and a large fireplace interior cover complete the most important common areas of the interior of the property. But not only we have a large and cozy building, but it is surrounded by a immense garden attention to detail with an exceptional decoration of outdoor furniture and spectacular views towards the mountain systems that complete the environment of this magical geographical situation. Among the services on offer is the breakfast , the systems of heating in all rooms, free WIFI connection , parking private and, the possibility of adding a cradle to the rooms if necessary . This is double rooms to which extra bed is added. All rooms have large windows or a terrace with views of the courtyard of the property. It also includes a complete private bathroom and a large closet to store personal belongings. 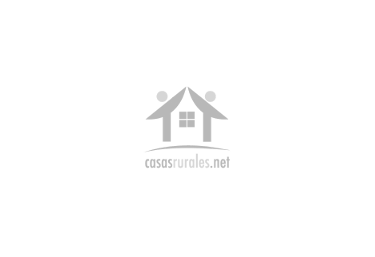 Double bedrooms, either with double bed or with double single bed . Each of them has its own private bathroom , system heating , television , window or terrace with outdoor furniture overlooking the exterior of the property and all the surrounding environment. Thanks to the privileged environment where the accommodation is located, it is possible to carry out both aquatic and terrestrial activities. There are numerous and varied routes to enjoy on foot, hiking, the bike or through the riding . In addition, it is also highly recommended to practice windsurfing, boat trips or routes on ATVs or quads . Among the most interesting places of interest is the Natural Park of Cabarceno, the Marshes of Santoña and Noja, the Cable Car of Fuente De or the Maritime Museum of Santander . Given its perfect location, it is 26 kilometers from Santander airport, 51 from Bilbao and less than 90 from Vitoria airport. Close to supermarkets and restaurants, our complex is close to both the Playa de Langre , just 15 minutes away, and the mountain systems of Buciero and El Cincho , both less than 7 kilometers away.